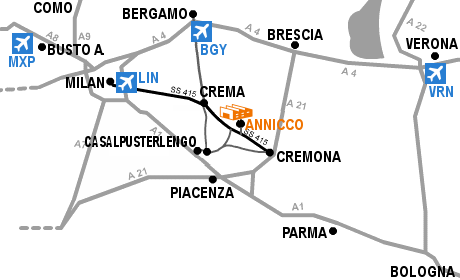 We are located in Annicco, in the northern part of Italy, 70 Km far from Milan 20 Km far from Cremona (the beautiful town of violins) and 25 Km far from Crema. Find Mosconi plants along the road Annicco - Soresina. Airports of Milan - Airport of Bergamo - Airport of Verona.